Sometimes it’s dizzying how fast things change. Wake up one morning, there’s thousands of dockless bike share bikes in town! The leader of the free world’s tweeting his country out of foundational international agreements! Nationwide legislative reform and major construction programmes in our major cities are being announced! What hasn’t changed? How strongly the physical fabric of our towns shapes us. To tweak Winston Churchill’s famous quote about buildings: “first we shape our streets, and henceforth they shape us”. Since first humans began living in clusters, our everyday environment - the shape of built environment - is overwhelmingly what determines our lives. Talk Wellington is a not-for-profit online platform fuelling Wellington people with better information to shape towns and cities. Especially now, it’s the transport systems, urban form, urban development that determine whether we know our neighbours, how active we and our kids are, how carbon-heavy our households. And as the famous New York Transport Commissioner Janette Sadik-Khan bluntly puts it: you get what you build for. Build for driving, you’ll get more driving. Build for active travel and public transport, you get more of that. Build for social connection, you get more of that. Ignore and sideline things that are actually important to us, and you’ll get less of them. Wellington’s pretty good, isn’t it? When we love someone, we want help them be their best self - and it’s the same with cities. While Wellington region and city turn up in “best destination” lists, and we pat ourselves on the back while trotting out our history of being NZ’s Most Public Transporting Town, we owe it to our town and to ourselves to acknowledge the writing on the wall. Our car-clogged urban centre streets, our plummeting rates of incidental physical exercise (especially amongst kids), the increasing social isolation even in our affluent suburbs, the carbon burden we’re forced to impose every day just for doing daily life - surely this isn’t who we want to be? Opinion polling regularly shows Wellington region folk have generally strong values: for our kids to be more active, for ourselves to be more active and healthier, to know our neighbours, to be kinder on the environment, to have more quality time for those we care about. We’re proud of our historic reputation for being clean and green and active. So it’s our environment making it too hard for us to manifest those good values: the good choices have been made too dangerous, too complicated, too inconvenient, too much hassle for ordinary busy people. In other words, our built environment is stopping us from being the people we want to be. Part of the problem with the big decisions that shape our environment is that ordinary Wellington region people don’t participate enough - and well enough - in shaping these decisions. For ordinary busy people, the built environment is typically shaped by things beyond our ken: planning decisions and major investment decisions by central and local government, by property developers, by infrastructure organisations. Ideally, we citizens could let the experts and specialists get on with it, trusting that the government and market systems are all working well enough. But it’s not working well enough. A big problem seems to be a gap in the information that’s readily available to us. For some years now, the challenges of the media landscape and public-good blogging mean Wellington’s lacked a reliable source of good, engaging, thoughtful information about what’s shaping the places we live. ● Sometimes important issues don’t get coverage, so people are unaware of how these are shaping the place they live (and only experts or those with a vested interest have a say). ● Sometimes people are aware, but the issue seems too confusing for the average busy person to have an informed view. ● And sometimes it’s just hard to see how an ordinary layperson citizen could make a difference. Without good, engaging, thoughtful information about local transport, urban form, and urban development, too many good people who care about the place they live don’t take action to make their voices heard. We believe our towns and cities are poorer for this, so Talk Wellington is filling this gap. Talk Wellington is essentially a vote of confidence in Wellington region citizens. Our hypothesis is that over the next few years we will start to see thousands of people being empowered by good information and helping shape our streets, towns and cities for the better. Even small things make a difference - from having a chat with other parents at the school about school-zone driving, through to organising a neighbourhood street activation, or even just making a submission to Council. It’s working in Auckland: in the last five or so years they’ve has seen a huge lift in the quantity and - crucially - the quality of public engagement on place-shaping issues. The principal early generator of this was Greater Auckland (then Transportblog), and now progressive conversations are also being fuelled by Generation Zero, Simon Wilson’s writing, Auckland Conversations, and groups like Women in Urbanism. 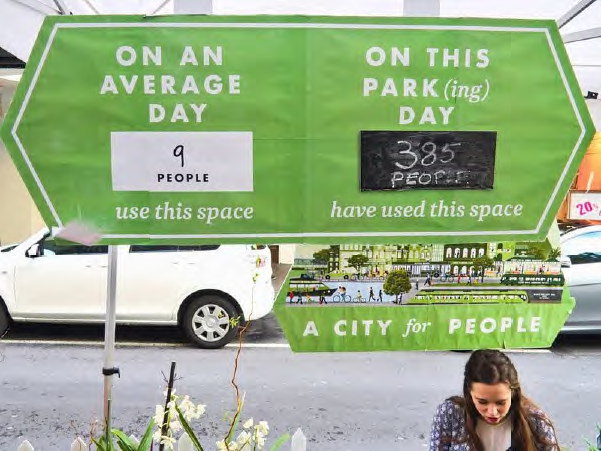 PARK(ing) Day. Image credit - MR Cagney. Wellington deserves more and better public engagement on big place-shaping issues - and we’re that much cooler, smarter and more networked than Auckland so we reckon it’ll work here. 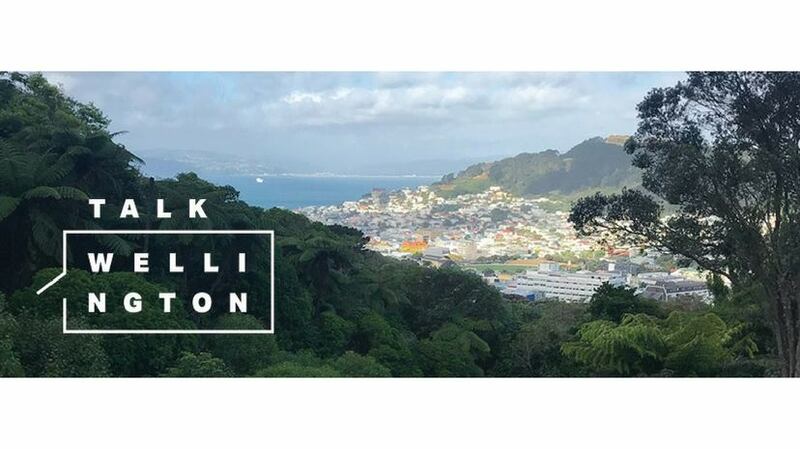 Talk Wellington’s mission is to get ordinary Wellington region people - with busy lives, who care about the place they live - engaged with what’s shaping our towns, and taking small (or big!) civic actions to make it better. We’re doing that with two things. Our website pulls the best information from here and elsewhere, and generates what Wellington people need: relevant, informative, accessible, engaging. And our extensive outreach activity through social media takes the ideas to people, and hooks them. We are deliberately less dignified than Greater Auckland: we believe the cat GIF is an extremely powerful tool for getting people reading about transport policy and zoning issues. What’s the model and what’s the plan? Independent, engaging information doesn’t grow on trees - and getting it into busy people’s lives to inspire their action takes lots of work. ● draw on expertise and energy across Wellington’s geographic and professional communities. Our startup year - (funded 95% by this article’s author, convenor Isabella Cawthorn) - has showed that the model is working. We have solid staff retention, our social media uptake is growing steadily, and we’re being sought out to provide content and comment for mainstream news, professional periodicals and blogs, and radio. Oldfield Road play street, in Hackney, London. Image credit -Hackney Council. We’ve been focusing on transport in 2018 because of the many big city-shaping initiatives happening (a new Government Policy Statement shifting investment, and Let’s Get Wellington Moving amongst many others). In 2019 we want more diverse voices in our content, especially younger people and Māori people. And we want to see more and better public engagement with issues like urban form and intensification, that define the accessibility, liveability and sustainability of our towns. But 2019 will need sustainable funding. It’s time to see if Wellington wants to see Talk Wellington continue for the next phase. If you also believe in the potential of Wellington region people to be city-shaping forces for good, check out our website - and have a look at the donate page and sign up to hear about our upcoming party!